Connect the $TOLOKA_ASSETS/js/image-annotation.js library (click in the Task interface section on the project page). 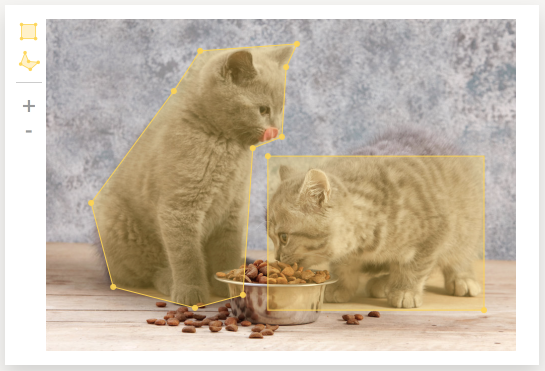 Field type: image-annotation, the image area selection editor. URL from the input data of the task. For example, from the field with url ID: src=url. Direct link. It is recommended to use HTTPS protocol. For example, src="https://mywebsite.ru/img1.png". Relative link. Specify the proxy Handlebars component and the input data field ID. For example: src=(proxy image). To add an image in the area selection editor, change the input data field type to string. The x and y values are numbers from 0 to 1. Length and width of the image are taken as 1, with the center of coordinates in the lower-left corner of the image. C closes a polygon connecting the first and last points with a line. D deletes the selected point, selected object or last point when creating the polygon. Arrows move the selected point. With Alt pressed, they move it slower. With Alt+Shift pressed, they move it faster. Tab moves from the selected point to the next one. Shift+Tab moves from the selected point to the previous one. Tell performers about keyboard shortcuts in the instructions to speed up the task completion. By default, rectangle tool is added to the task interface. createInterfaceElement() — Calls the interface DOM element (the method is called once during the initialization of the object). onShow(shape, options) — Displays the annotation interface element when the performer points the mouse at the selected area. Accepts JSON with polygon point coordinates. This JSON can be also used to save annotation entered by the performer. shape:start — Start of the area selection. shape:finish — End of the area selection. shape:cancel — Removal of a polygon point. shape:remove — Removal of area selection.